Every Year at the beginning of March, the hunting season for Wild Turkeys opens up. Intended to coincide with the biological mating season of the Osceola Wild Turkey, March is a little late, because the Big Cypress Swamp wild turkeys start to get amorous in late January and early February. By mid-February, the dominate gobblers already have a harem of hens. making it very difficult to call a dominate (and bigger) Gobbler to a turkey call. Every morning the gobbler will gobble a few time to let his hens know where he is and they assemble with the gobbler to start mating. The gobbler is not interested in going to any hen that is not assembled with him, until he has serviced all of his harem. Then if he has any strength left, he may start gobbling again, listening for a new hen to join his harem. The key to this is he is expecting the new hen to come to him, not the other way around. He is not about to leave his hens alone, if there is a possibility of an interluder. This makes calling the Gobbler to a turkey call near impossible. 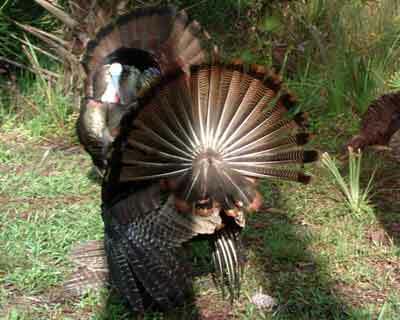 Turkey hens use cutting sounds to announce they are ready for mating Chances are high, that when turkey calling at the beginning of Turkey hunting season in the Big Cypress Swamp and a gobbler is coming to your call, it will be a non-dominate gobbler or a jake turkey (first year male turkey). 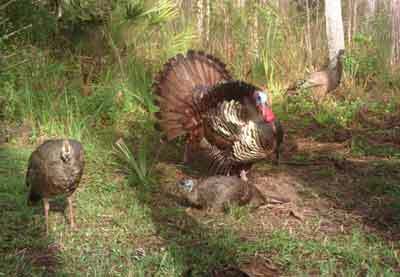 It is a reverse of nature for a gobbler to come to a hen call, normally the hen goes to the male gobble call. The dominate (biggest and badest) males will have their hens and the other gobblers will still be searching for hens to mate with. 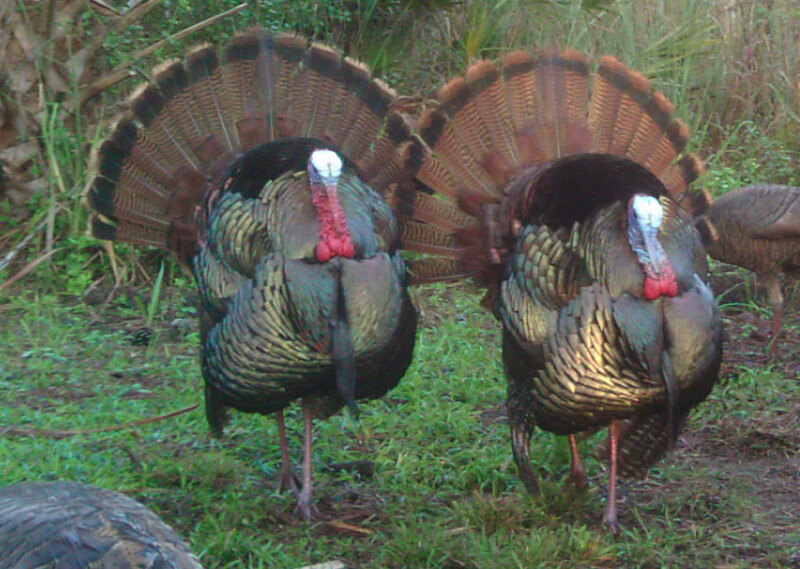 There are no absolutes in nature, so the turkey coming to your call could be a big dominate male, but not likely. It is a fact though, that non-dominate turkeys and jakes taste just as good as the dominate turkeys, so unless you are a trophy hunter, any of these gobblers will be fine at the dinner table. Later in the turkey season, the hens that have mated with the gobbler, will start to nest. 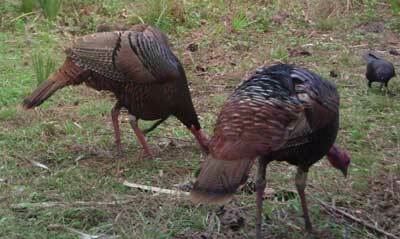 They will mate with the gobbler in the morning to fertilize their eggs and then nest to lay eggs and spend time on the nest incubating them. The dominate gobbler will start searching for new hens about mid-morning during this period of time and become more susceptible to being called into gun range. How does one gobbler become the dominate trukey? The gobblers will square off, first showing off there size, by spreading their tail feathers and puffing up all their feathers. The drop their wings and spread out their wing feathers to make themselves look bigger. They will strut around this way, making a aggravated or Fighting Purr sound. All this is in hopes one of the gobblers will back down and give up. If neither turkeys back down, they will fight to determine who wins. Once a winner is determined the loser will leave and the winner may switch to making spitting and drumming sounds. From his chest, vocalization is forced making a low-pitched sound. Its a sound that is difficult for a human to hear, but on a calm day, drumming can be heard up to about 100 yards away. This sound, along with the blown up display of feathers, attracts the hens. Don't expect to see a gobbler displaying while hunting, you will most likely see a harvestable turkey like the one shown below. Turkey Gobblers deciding who the Dominate Turkey is! Which turkey in the picture to the left is legal to shoot? The turkey on the left side of the picture. 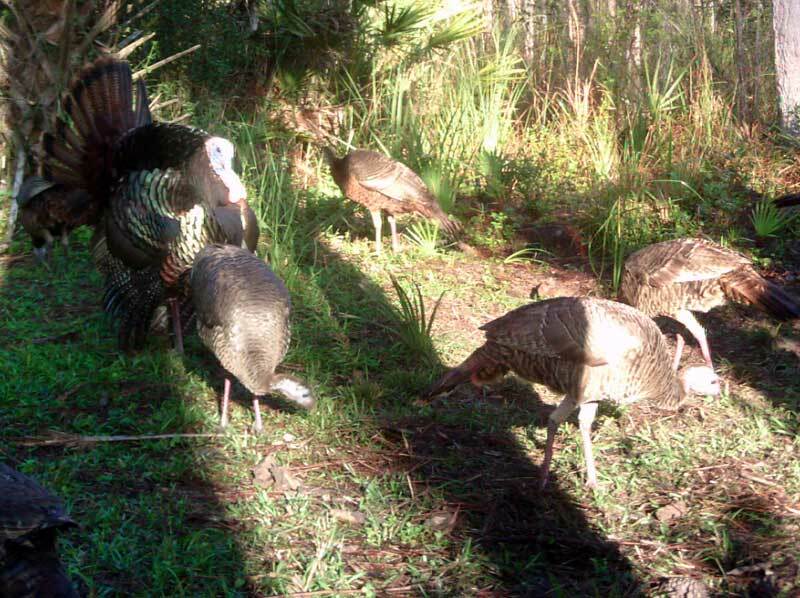 It is only legal to shoot bearded turkeys in the Big Cypress Swamp. The beard is the string of thin feathers hanging from the turkeys chest right below its neck. A beard is not visible on the other turkey. There are distinguishing differences between the hen and the gobbler, but sometimes hen's have beards and the rule is you can shoot bearded turkeys.